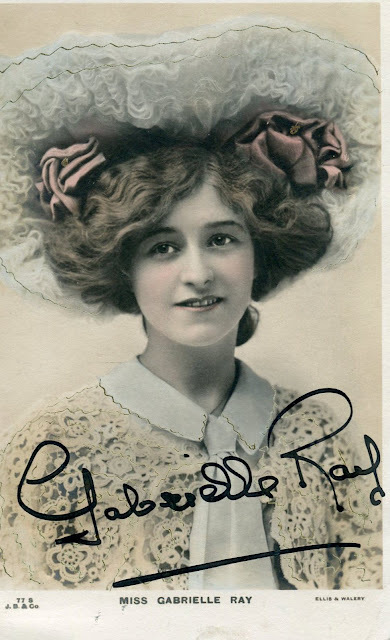 Gabrielle Ray announced her retirement to marry the wealthy Eric Loder in early 1912. She did not appear at the well-attended scheduled ceremony at St Edwards Roman Catholic Church in Windsor because of Loder's failure to sign the prenuptial contract, but the marriage took place soon afterwards. Loder strayed, however, and the couple divorced in 1914. The broken marriage was difficult for Gabrielle, but in 1915, she returned to the stage to play a few roles and for nearly a decade she appeared occasionally in provincial variety tours and pantomimes, finally leaving the stage about 1924. After this, she struggled with depression and alcohol abuse, and her health declined. In 1936, she suffered a complete mental breakdown and was institutionalized for nearly forty years. Gabrielle Ray died in 1973 at Holloway Sanatorium in Egham, Surrey, England, at the age of 90. How sad, 40 years in an institution at that time must have been awful. thanks for the link. It isn't much comfort but Holloway Sanatorium was supposed to be quite progressive for the time but I often wonder why her family didn't make more of an effort to take her out, especially as they benefited from fer estate on her death. Her grave, much like others of the period is rather sad and neglected, the Musical Hall Guild have taken over the care of the grave and are planning to restore it but she is in a queue, I did offer to pay for the restoration but they weren't interested. One of the strange benefits of the internet is that one can easily visit a grave of someone. So I looked at Gabrielle's resting place. A subsided tombstone in a field of grass is not what you expect indeed. It isn't but I suppose that there were so many people who were briefly famous then, like Miss Ray fell into obscurity and it's only because of collectors that they "live" again. Her story, or rather the lack of it is what makes her interesting but sadly despite her fame at the time she is still often only a footnote in other peoples stories. What a sad story for such a pretty face.It’s always a shame to hear of neglected graves but at least your blogpost brings her to life for us all. Such a beautiful face and smile she had! It's wonderful that she lived to be 90! A really pretty face, almost child like. Miss Ray was about 20 when she performed in "The Orchid" but looked younger than her true age.